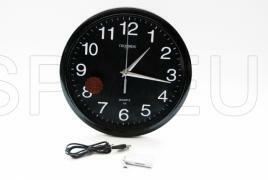 This large and stylish wall clock has a built-in camera with remote control. With it you can make audio-video recording in AVI format in resolution 720x480 pixels. For controlling the recordings there is a remote with range up to 10 meters. Starting and stopping the recording process is done by pressing the button on the remote control. The camera has an internal rechargeable battery that allows about two hours continuous recording.